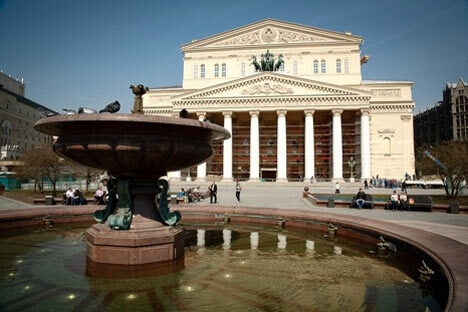 The renovated Bolshoi Theater will reopen its doors in the fall. After six years of renovations that have been beset with allegations of corruption, infighting, delays and political point-scoring, the Bolshoi Theater’s main stage will open again to the public this autumn. Following a gala concert at the end of September that will likely be attended by both the cultural and political elite of the country, the more serious business of opera and ballet will begin on October 2, as one of the world’s most famous theaters finally gets its home back. The first performance on the newly renovated stage will be of Mikhail Glinka’s “Ruslan and Lyudmila”, regarded as the first major Russian opera — so far, so predictable. Somewhat more surprising, perhaps, is the choice of director for the opera. Dmitry Tcherniakov offended traditionalists with his Bolshoi production of “Eugene Onegin” in 2006 so much that legendary soprano Galina Vishnevskaya vowed never to set foot inside the theater again. Vishnevskaya’s tirade notwithstanding, Tcherniakov has become something of a “house director” for the Bolshoi, with “Ruslan and Lyudmila” set to be his fifth production at the theater. His “Onegin,” while controversial at home, so impressed international audiences that he is now one of the most in-demand opera directors going, and Russia Profile caught up with him in London during rehearsals for his production of “Simon Boccanegra” at the English National Opera, which opened in June to mostly positive reviews. However, the route back to the stage of the Bolshoi was not a straight one. Tcherniakov studied architecture, and even when he graduated and realized that his real love was working on the stage, he first became involved in dramatic theater, working at a number of theaters in Russia, and in the Lithuanian capital Vilnius, before trying his hand at his first opera, a contemporary work staged in Novosibirsk in the late 1990s. He realized that opera, after all, was his calling, and while he still directs drama, the majority of his work is now in opera. His first staging at the Bolshoi was “The Rake’s Progress,” Igor Stravinsky’s masterpiece, which he put on in 2003 just after the opening of the theatre’s New Stage. It was the first time the Bolshoi had staged the work, and the first time the theater had put on an opera in English, and it garnered good reviews for the direction, if not for the English-language diction. As theatres in Europe got wind of the new young Russian director, from this production and from the three operas he had staged at the Mariinsky with Valery Gergiev, he began to be invited to opera houses in Europe, especially in Germany. Notable was a 2005 production of Modest Mussorgsky’s “Boris Godunov” in Berlin with Daniel Barenboim conducting. Tchernaikov’s “Onegin,” for all that Vishnevskaya despised in it, has been hailed by others as a masterpiece, and the attention to detail is incontrovertibly extraordinary. There are a few liberties taken with the action—guns don’t appear when you expect them to, such as during the duel scene, and then they do appear when you don’t, in the final scene, the distraught Onegin attempts to commit suicide, but finds his gun is unloaded. But by and large, the unexpected moments work, and help to bring out elements of the characters that remain undeveloped in other productions. The desperation to impress and the ultimate pathos of his Lensky, in particular, is beautifully drawn, and for opera, an unusual amount of attention is paid to realistic acting techniques. “Especially when I’m working in Russia, I have a real desire to create an authenticity, and a documentary-like style, because in Russia opera often functions as an imaginary world that’s very different from the world we live in and the lives we lead. Opera shouldn’t be decorative, it should have relations to the people sitting in the hall, and so I’ve always tried to attain this documentary feeling.” As such, he said, he finds it awkward when critics or other theater-goers give him opinions on artistic or directorial elements of his stagings, but if someone comes to him and tells him that a particular moment in one of the operas reminded them of events or emotions in their own life, he feels that he has succeeded. Since then, he has been back at the Bolshoi to produce a stunningly effective version of Alban Berg’s avant-garde opera “Wozzeck,” and a rather less impressive “Don Giovanni.” Many of his stagings are claustrophobic, set in box-like environments, sometimes literally. The visually striking “Wozzeck” features the stage compartmentalized into 12 small boxes, while the “Tristan und Isolde” he put on at the Mariinsky sees the action take place on a submarine. The first five scenes of “Onegin” take place in the same room, including the duel scene, which is reinvented as a brawl gone wrong, the morning after Tatyana’s birthday party. As for the bizarre “Don Giovanni,” Tcherniakov himself said he was unhappy with the way the production, which had originally been premiered with a different cast in Aix-en-Provence, went off in Moscow. Some confusing rewriting of the story and the relationships between the characters was off-putting and simply didn’t seem to work. Before that, there will come the big test of “Ruslan and Lyudmila,” and how it will be received at such an extraordinarily high-profile event as the reopening of the Bolshoi. Asked if it will be scandalous, he laughed gently. “I never try to create a scandal,” he said.